The TA-2016MB-WM wall-mounted digital gas detector is wireless and explosion-proof, and can detect hundreds of gases and vapors. It features LED alarm indicators, a front panel with push-button channel setup, and an auto-configuration wizard that provides rapid and easy channel setup. 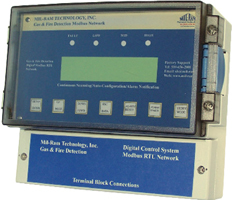 The monitor includes a latching or nonlatching function.